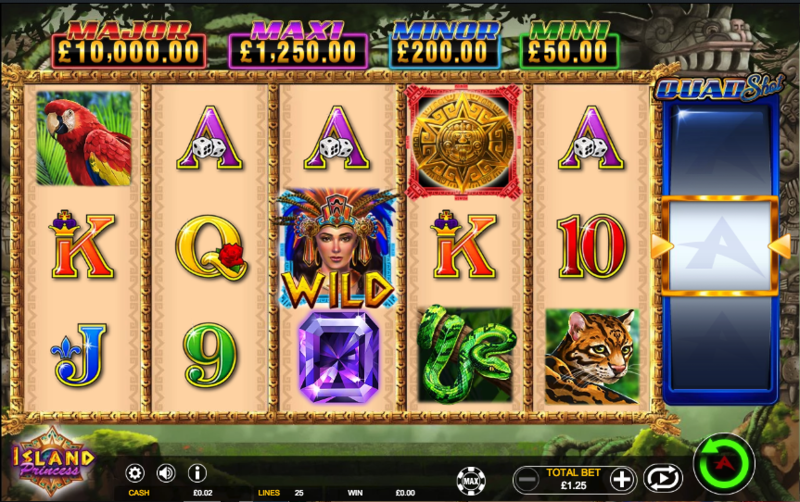 A trip to an ancient empire awaits us now as we board a virtual flight to check out this online slot machine from Ainsworth gaming; it’s called Island Princess Quad Shot and it’s part of that series of games which offers a sixth reel as the route to the jackpot prizes shown above the reels. Island princess Quad Shot is a five reel slot with three rows and twenty five fixed paylines; an ornate golden frame borders those reels which exist in some steamy jungle setting complete with freaky statues. The higher value symbols include a pyramid, a purple jewel, a wild cat, a parrot and a green snake; 9, 10, J, Q, K and A represent the lower values. The princess with the snazzy headdress is wild, she appears only on reels two, three and four and she will replace all others to help form winning matches except for the gold coin scatter symbol. This is triggered by landing at least three of the scattered gold coins anywhere on reels two, three and four for which you will receive an initial eight free spins. During this feature the coin scatter symbols will only appear on reels one and five but if you can land both on the same spin you’ll receive five extra spins. Major Bonus – five of a kind win with no wilds and a Quad Shot Bonus in the sixth reel. Minor Bonus – five of a kind win with wilds and a Quad Shot Bonus in the sixth reel. Maxi Bonus – five of a kind win featuring royals (9, 10, J, Q, K and A) with no wilds and a Quad Shot Bonus in the sixth reel. Mini Bonus – five of a kind win featuring royals with wilds and a Quad Shot Bonus in the sixth reel. Island Princess follows a similar design to other Ainsworth slots, particularly the other Quad Shot games so if you’ve tried them you’ll know what you’re getting here. There’s plenty of life and colour here and of course the jackpot prizes to tempt us – it comes with a slightly low RTP of 94.33%.